More likely, the oval sapphire is at most 9 carats. Based on the size of the sapphire compared to Diana's iris (the blue part of her eye which is approximately 12mm), the oval sapphire is about 13mm x 9mm and the round diamonds close to 3mm in diameter. When the official engagement photos were released, Diana's engagement ring only had 8 prongs: 2 in each corner. 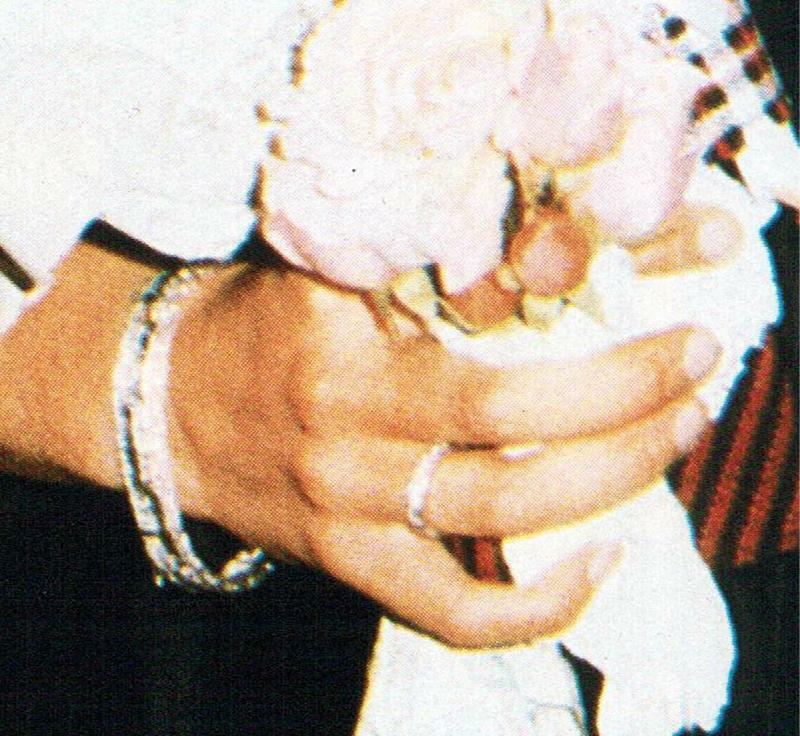 By December 1981 (this is the earliest photo I could find from books that I own where the ring is clearly visible on Diana's finger), more prongs were added, making it look as it is now on Kate Middleton.
" ...Four months after the funeral, it was Burrell who opened the black front door to Kensington Palace and welcomed the boys for one last walk through the apartments they had shared with their mother. William shook Burrell's hand, but "Harry ran across and hugged me," the butler recalled. "He knew my heart was breaking as much as theirs." Then, as a tearful Harry held on tight to Burrell, they walked from room to room, picking out mementos to take with them to their new rooms at St. James's Palace. Among other things, William chose the Cartier Tank watch that the Princess always wore - a gift from her father, the eight Earl Spencer. Harry picked out the sapphire-and-diamond engagement ring given by Charles to the blushing "Shy Di" when she was just 19." Both Prince William and Prince Harry inherited their mother's estate. Indeed, Prince Harry selected his mother's sapphire and diamond engagement ring as a memento (http://www.dailymail.co.uk/femail/article-1330366/Prince-Williams-engagement-ring-Kate-Middleton-sapphire-diamonds.html) when they visited Kensington Palace four months after Diana's death. 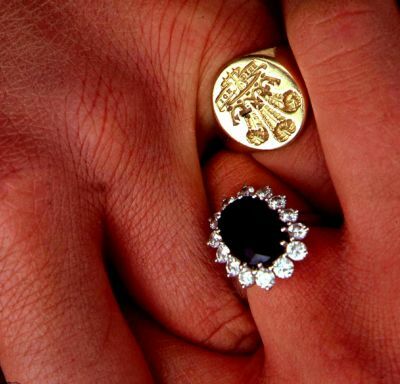 Even though it was with Prince Harry, this ring remained the property of both brothers. According to this article (http://www.people.com/people/package/article/0,,20395222_20443190,00.html), the brothers had an agreement that whoever got engaged first would present their mother's engagement ring when they proposed marriage. 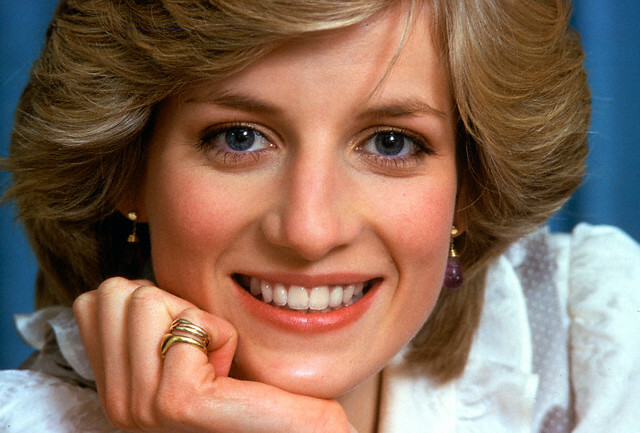 Diana, Princess of Wales, smiles during a private photo session at her home, Kensington Palace. 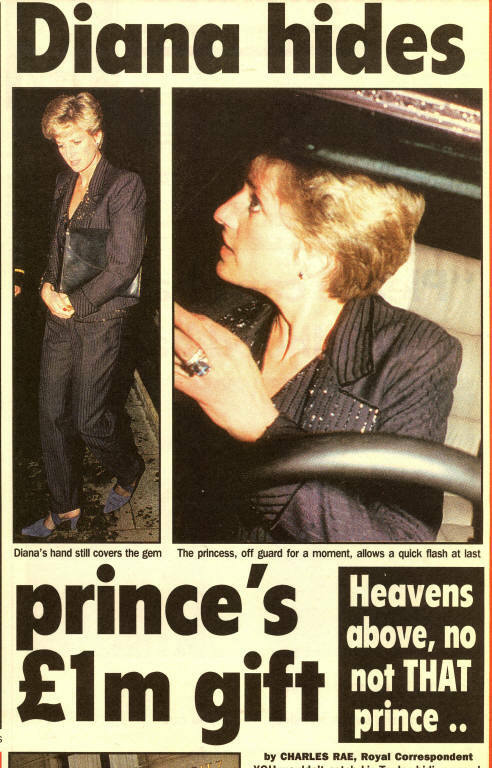 Picture scanned from 'The Story of DIANA' p.101 by David Levenson and Trevor Hall, 1985. This book doesn't have any page numbers so the numbering I used starts immediately after the family tree page. 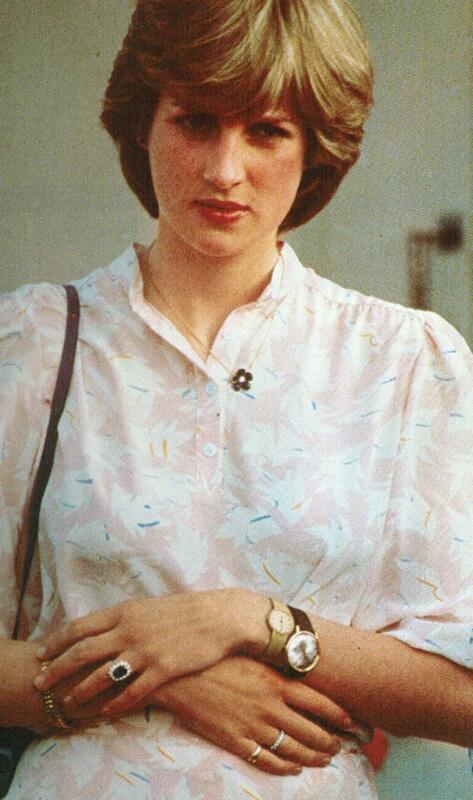 Lady Diana watches Prince Charles play polo during their engagement. She wears his watch on her arm in addition to a watch and a bracelet she received from Prince Charles as birthday gifts. 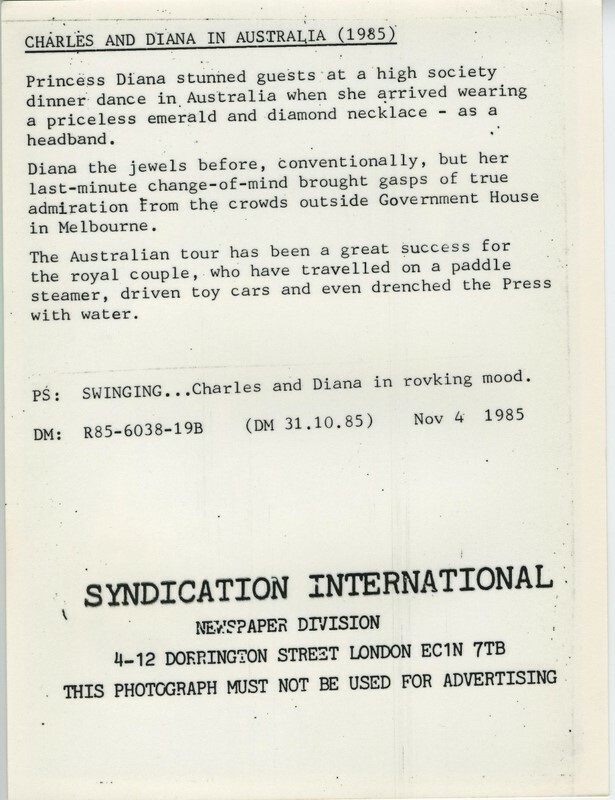 Thanks to JoeK for pointing out to me via e-mail that the aquamarine ring is a separate piece from Diana's 5-strand pearl and aquamarine bracelet. Diana wore both aquamarine ring and bracelet in Australia 1996 for a Dinner Dance at the Victor Chang Cardiac Research Institute. Photos taken during Christmas 1982 photo session at Kensington Palace. 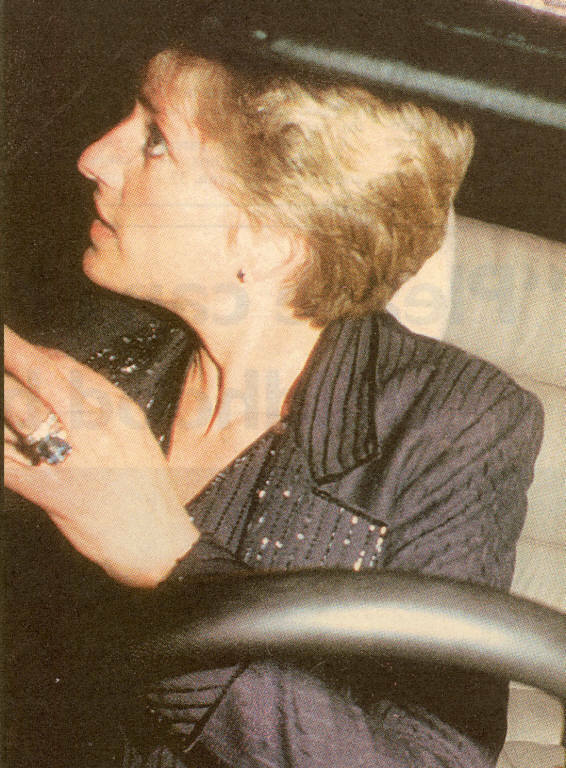 This seems to be the one and only time Diana wore this sapphire cabochon ring. Perhaps she was trying to protect Prince William from getting scratched by her engagement ring during this photo session. Pictures provided by MClark via e-mail. At first glance, this ring looks like the emerald cut aquamarine but close-ups reveal it is an oval blue stone. 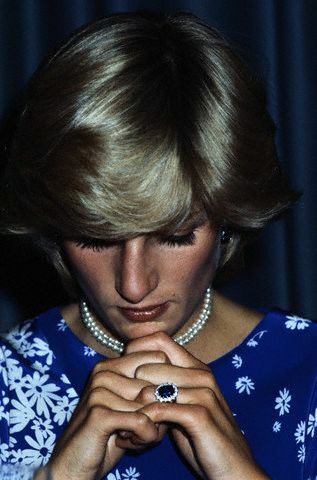 Diana wears this blue oval stone ring with her diamond eternity band. Not sure what year this picture was taken. If anyone can provide more information, please let me know. The newspaper mentions that Diana is covering this gem. Pictures provided from MClark's scrapbook via e-mail. This ring was pointed out to me via e-mail by Boris from The Royal Jewels of World Message Board. 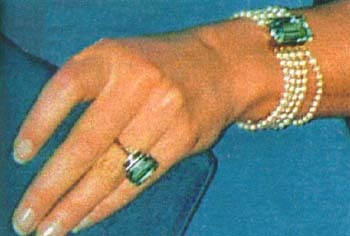 Instead of her engagement ring, Diana wears what looks to be an emerald cabochon and diamond ring. The two stones are not aligned but are at an angle to one another, very similar to a style of a bypass ring. Picture scanned from my own personal scrapbook. I cut this picture out from Royalty but have no clue what issue it was. The pictures above and below are of the same event. 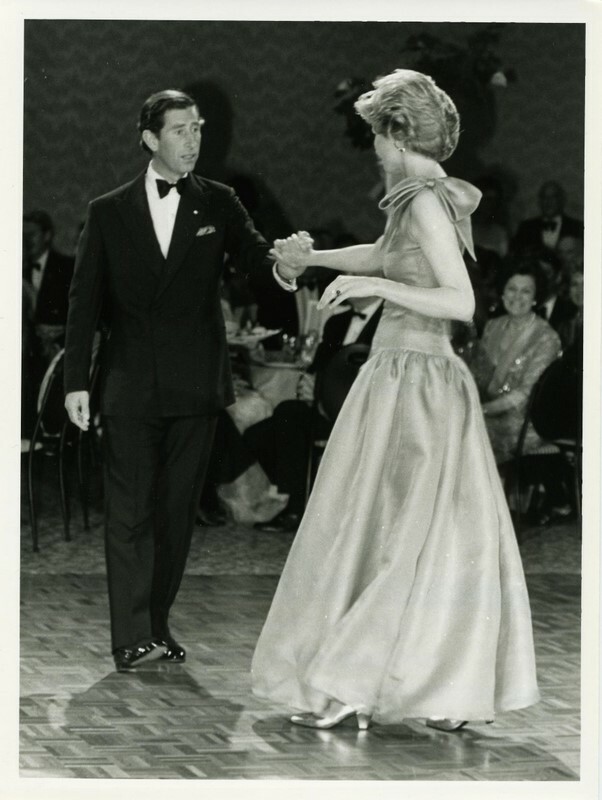 Prince Charles and Princess Diana dance at the Hotel Hyatt during a tour of Australia. This black and white photo shows the diamond and emerald ring from a different perspective. I am a bit confused by the dating on this. Corbis dates the event as January 1988 but the photo below dates it as November 4, 1985. 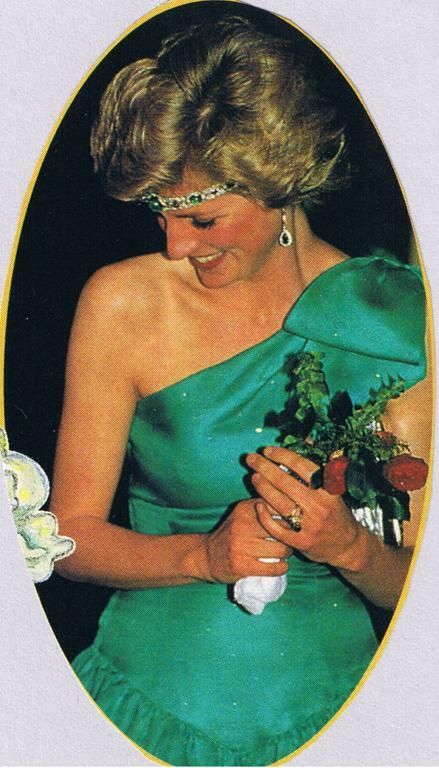 Can anyone verify if there were two different events that Diana wore this dress? These pictures were copied from an Ebay auction from Ebay seller pumpparkphotos. 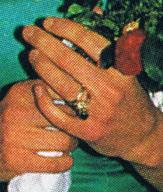 Diana wore this ring again in 1993 at the event below. In my Christie's auction catalogue, 'Dresses from the Collection of Diana, Princess of Wales,' there is a huge picture of the photo below (in page 95) and the ring is quite visible with green and diamond stones. In order to scan a better picture of her hand, I would have to break my catalogue which is something I am unwilling to do. Sorry. Perhaps someone out there has a better picture of Diana from both these events. 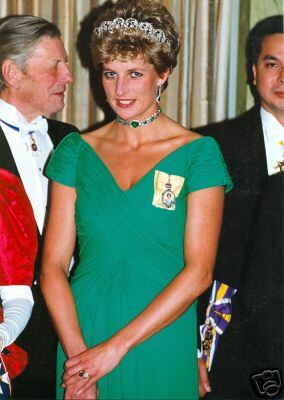 Princess Diana wears a lime green Catherine Walker gown to a banquet at the Dorchester Hotel for the Yang di-Pertuan Agong of Malaysia. This picture was copied from an Ebay auction from Ebay seller montessorimommy1.